You know that choosing your Tampa Bay wedding venue is important, but have you also thought about where you’ll be getting ready? As a Tampa Bay wedding photographer, we spend about two hours pre-ceremony capturing getting ready photos and details. Because about 20% of your wedding day is at your getting ready location, it is an important element in documenting the start of your big day. Lighting is crucial! Make sure to select a location with good, natural light (think windows), which works great for details and portraits. A skilled wedding photographer can of course light any situation, even if it is a dark room. However, large windows help provide a beautiful ambiance to what otherwise could be a drab environment. 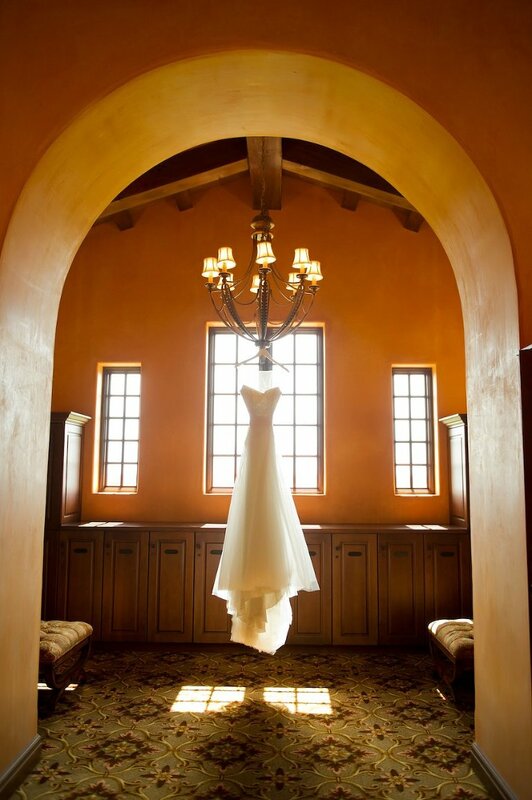 If you happen to book a bridal suite for your wedding, that’s great, but don’t feel obligated to do so. 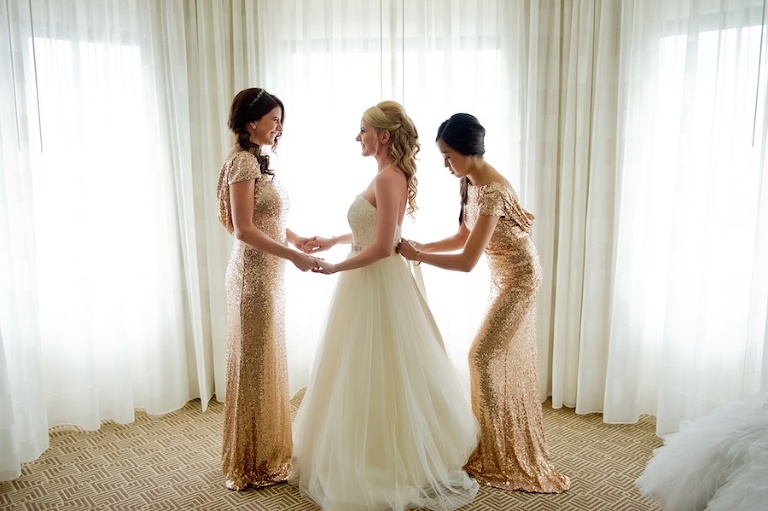 However, a room with enough space for you and your bridal party makes a huge difference. There are often other people coming and going throughout the day (hair and makeup artists, florists, planners, parents, etc. ), so select a location that will be spacious enough for your party and for you to be comfortable in. We can always take details outside of a room if need be, but typically the more space the better. Although we know it can be hard when you have several people and all of their belongings, keep the room as tidy as you can. Clutter can ruin your images; no one wants to see random shoes, luggage or drinks in the background. As wedding photographers, we are there to help in hiding the clutter (we are masters at this by now) but it also helps when your are proactive in helping the process. We appreciate this! If your wedding ceremony isn’t at the venue you are getting ready at, factor in the travel time from your that location to the ceremony. This needs to be determined ahead of time so that the wedding timeline stays on schedule. Once of aspect falls behind, typically the rest of the day tends to run behind as well. 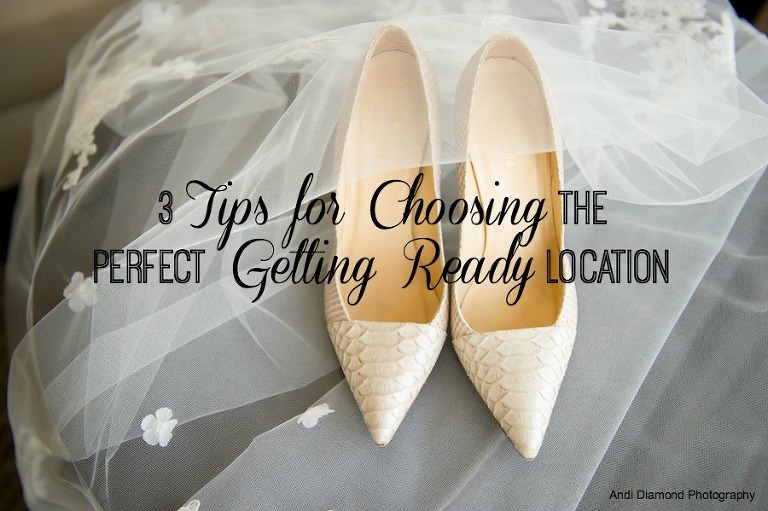 Ideally, a short travel time is more convenient for you, your vendors, and your guests. For consistency in the appearance of your images, it’s best to have both wedding parties get ready at the same location. Plus, it is more convenient! Though, don’t get rooms too close, we wouldn’t want an accidental run in before the wedding! Tampa wedding photographer, Andi Diamond, makes it her goal to truly get to know her clients as friends. 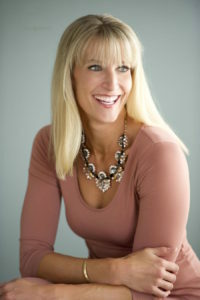 Through building a trusting and fun relationship, she is able to create images that are authentic, while helping to creatively coach her couples into looking and feeling their absolute best. She wants your images to be so much more than just creative and unique. She wants you to feel the emotion, love and energy that you experienced with your family and friends on your wedding day for years to come when you look at your wedding images. And in all honesty, she does it for the wedding cake and massive hugs she gets at the end of the day.